The journalist said she was grabbed by the shoulders and shoved outside. The EPA said there was no room but later reversed course and let the reporters in. WASHINGTON — The Environmental Protection Agency barred The Associated Press and CNN from a national summit on harmful water contaminants on Tuesday — and guards forcibly shoved a female reporter out of the building. 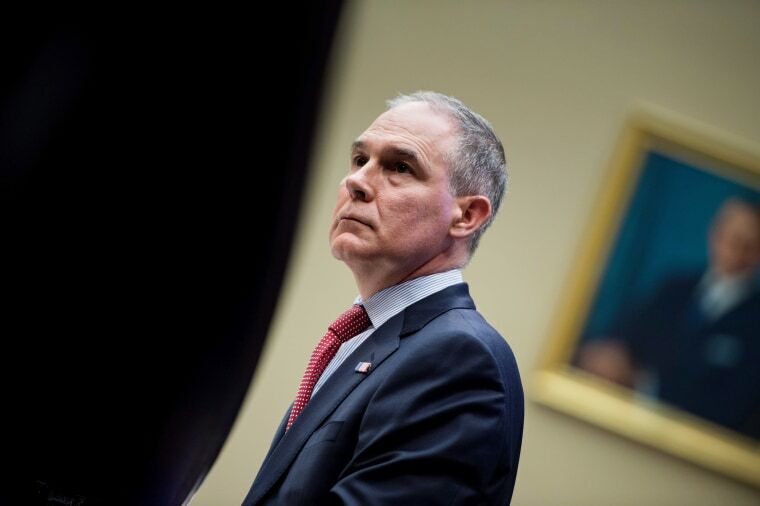 The EPA blocked the media organizations, along with the environmental-focused E&E News, from attending the meeting in Washington, convened by EPA chief Scott Pruitt. Guards barred an AP reporter from passing through a security checkpoint inside the building. When the reporter, Ellen Knickmeyer, asked to speak to an EPA public-affairs person, the security guards grabbed the reporter by the shoulders and shoved her forcibly out of the EPA building. She said she was not injured and was later permitted to attend the meeting. "The Environmental Protection Agency's selective barring of news organizations, including the AP, from covering today's meeting is alarming and a direct threat to the public's right to know about what is happening inside their government," said AP Executive Editor Sally Buzbee. "It is particularly distressing that any journalist trying to cover an event in the public interest would be forcibly removed," Buzbee added. "We understand the importance of an open and free press and we hope the EPA does, too," CNN said, according to the AP. "This was simply an issue of the room reaching capacity, which reporters were aware of prior to the event," Wilcox told NBC News. "We were able to accommodate 10 reporters, provided a livestream for those we could not accommodate and were unaware of the individual situation that has been reported." The reporter threatened "negative coverage" if she couldn't get in, Wilcox alleged. Some media that had been permitted to attend said that there appeared to be a handful of open seats for the press in the room despite claims that there was no room left. A reporter for E&E News tweeted about being shut out by the EPA. Amid criticism for barring the media outlets, Wilcox announced later that the afternoon session of the meeting would be open to all press. Following that decision, the AP said, "We are pleased that the EPA has reconsidered its decision and will now allow AP to attend the remainder of today's meeting. The AP looks forward to informing the public of the important discussions at the water contaminants summit this afternoon." Convening Tuesday's session, Pruitt is pledging to work on establishing a maximum allowable level for the chemicals in drinking water. Representatives of states, tribes, the chemical industry, environmental groups and others attended the session. Claire Atkinson and Hallie Jackson contributed.